Sun Cellular bring this feature to all their prepaid subscribers, you can now have a customized mobile number with their ‘Name Your Number Sim’ offer. This is new to all prepaid subscribers as this feature usually offered by telcos in postpaid plan. With Sun Name Your Sim you can have a unique mobile number like for example, 0943-9-CALL-ME, 0943-8-I-DUNNO or 0942-8-TEXTME. You may also prefer to customize your sim number based on your birthday, anniversary and other important number combinations you wish. Continue reading more about Sun Cellular Name Your Number Sim after the jump break. To customized your Sun Cellular number using Name Your Number Sim just insert your new sim card and dial *247#. Just follow the instructions to continue the process in customizing your mobile number. Where to buy Sun Name Your Number Sim? 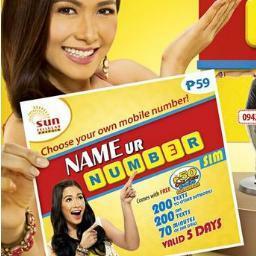 You can avail Sun Cellular Name Your Number Sim on your nearest Sun Shops and Sun retailer to avail the this product. For more information and updates of this product you may visit Sun Cellular Facebook page and Twitter account. I've been trying to get a number but no confirmations yet..how do I know that my selected numbers are ready for use? HELP! I dont get any confirmation, now i dont no how to use my sim now!!! WOW! its so nice and easy!! YOUR the best NETWORK SUNCELLULAR!! same ganun din sakin kakabili ko lang ngayon. emergency call daw. i am very dissapoint... sana wag na nila i endorse nakakasira lng ...sa network..love q pa naman SUN. so what kung bago Cp mo? matagal po talaga yung confirmation nila? processing pa rin daw kasi eh. Bale ang pwede lang piliin talaga e' un last 6 digits at syempre di pwede un mga 888888,111111, etc. may suggested numbers naman kaya madali lang.. wala pang 1 minute. ANO BA YAN!! HINDI RIN GUMANA YUNG SKIN NGAUN, KAKABILI KO LNG DIN IMPORTANTE PA NMAN.. KAINISSSSS!!!!!!!!!!! !